Sceptics protest that these figures are inflated; that mental health has become too medicalised; that everyone gets stressed and anxious and down on occasions, and that over-diagnosis trivialises the suffering of those who have “real” mental illness. However, the same complaints are not made about physical health problems, as pointed out by psychiatrist Dr David Rettew in a Psychology Today column. Most of us will likely experience some kind of pulmonary or orthopaedic diagnosis at one stage or another, he notes, but no one says such conditions are being over-diagnosed. If you have slightly elevated blood pressure, you’re generally diagnosed with hypertension and advised to exercise and watch your diet. Can you imagine, asks Dr Rettew, if a doctor said they were raising the new blood pressure threshold to 160/100 so that only the most “real” cases are diagnosed? The notion that mental illness only happens to “other” people, to an unlucky minority, contributes to shame and stigma, resulting in unnecessary secrecy and isolation. Now, this sense of stigma has reduced significantly in recent years – I see from my own clinic how much more comfortable and open younger people are in talking about their mental health. Nevertheless, there is a long way to go in this regard. Most people, the New Zealand researchers point out in a Scientific American article summarising their research, 'will never receive treatment and their relationships, job performance and life satisfaction will likely suffer'. One potential remedy is to introduce mental health screening in schools. Research indicates only one in four children with a mental health problem get identified or treated. Untreated, childhood anxiety can worsen and become a lifelong habit – a terrible pity, given that in most cases, relatively simple cognitive-behavioural strategies can help children tame their worries. For adults, however, the key point is this: short-term, one-off periods of mental illness are perfectly normal. ‘If you ever develop a psychological disorder, many assume you will have it for life,’ the researchers write. 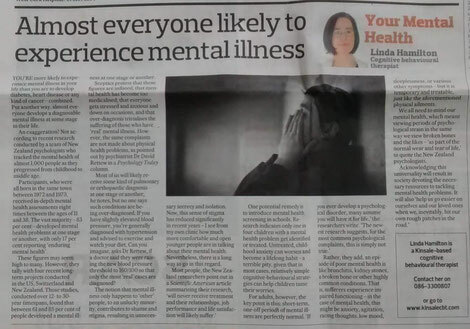 ‘The newest research suggests, for the most common psychological complaints, this is simply not true.’ Rather, they add, an episode of poor mental health is like bronchitis, kidney stones, a broken bone or other highly common conditions. That is, sufferers experience impaired functioning – in the case of mental health, this might be anxiety, agitation, racing thoughts, low mood, sleeplessness, or various other symptoms – but it is temporary and treatable, just like the aforementioned physical ailments. We all need to mind our mental health, which means viewing periods of psychological strain in the same way we view broken bones and the likes – 'as part of the normal wear and tear of life', to quote the New Zealand psychologists. Acknowledging this universality will result in society devoting the necessary resources to tackling mental health problems. It will also 'help us go easier on ourselves and our loved ones when we, inevitably, hit our own rough patches in the road'.